WHETHER THE PRIVILEGES COMMITTEE OF PARLIAMENT IS EMPOWERED, JURISDICTIONALLY, TO INVITE CITIZENS AND NON-MEMBERS OF PARLIAMENT BEFORE IT FOR EXAMINATION FOR CONDUCT OCCURING OUTSIDE OF PARLIAMENT. On 22nd June, 2015, the undersigned was invited by letter with reference number OP/T/FLT/0105 to appear before the Committee on Privileges. The undersigned appeared before the said Committee on Thursday 25th June, 2015, where he was examined by the Committee in an interaction that was mutually respectful and cordial. Since then I have noticed through the public medium that other individuals have been invited to appear before your committee. Personally, I would like to thank the Committee for that privilege, with certain reservations I would like to point out at this time. Mr. Chairman, I believe, would be the first to recognize that all institutions in Ghana, including Parliament and the Privileges Committee of Parliament, ultimately derive their authority from the 1992 Constitution. Any jurisdiction exercised by any organ created by the 1992 Constitution, which falls out of the purview of the constitutional guidelines stated in that Constitution, would be jurisdiction exercised beyond the legal boundaries and therefore ultra vires, I believe. A diligent search of the 1992 Constitution reveals that the issue of privileges with regard to parliament and members of parliament fall under Articles 115 and 116 of the 1992 Constitution. Indeed it is these two articles that create the Privileges Committee and grants it the powers it exercises. (2) That at no point does Article 115 and 116, in their entirety, grant a scope to the Privileges Committee to exercise jurisdiction on persons and entities who are not Members of Parliament. 115. There shall be freedom of speech, debate and proceedings in Parliament and that freedom shall not be impeached or questioned in any court or place out of Parliament. 116. (1) Subject to the provisions of this article, but without prejudice to the general effect of article 115 of this Constitution civil or criminal proceeding shall not be instituted against a member of Parliament in any court or place out of Parliament or any matter or things brought by him in or before Parliament by petition, bill, motion or otherwise. (2) Whenever in the opinion of the person presiding in Parliament a statement made by a member is prima facie defamatory of any person, the person presiding shall refer the matter for inquiry to the PARLIAMENTARY COMMITTEE ON PRIVILEGE (emphasis supplied) which shall report its finding to Parliament not later than thirty days after the matter was referred to it. (3) Where the committee referred to in clause (2) of this article report to Parliament that the statement made by members is defamatory of any person, the member who made the statement shall within seven days after that report render an apology at the bar of Parliament, the terms of which shall be approved by the Parliamentary committee on privilege and communicated to the person who have been defamed. 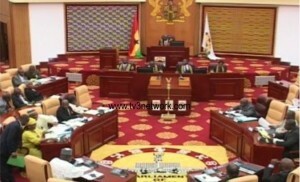 (4) Where a member refuses to render an apology in accordance with clause (3) of this article the Speaker shall suspend that member for the duration of the session of Parliament in which the defamatory statement was made and a member so shall suspended shall loose his parliamentary privilege, immunities and remuneration, but they shall be restored to him if, at any time before the end of the session he renders the apology as required by clause 3 of this article. (5) A person who has made a contemporaneous report of the proceeding in Parliament, including a statement which has been the subject of an inquiry under clause 2 of this article, shall publish the apology referred to in clause 3 or the suspension or the apology referred to in clause 4 of this article with the same prominence as he published the first report. (6) If a person fails to publish the apology as required by clause (5) of this article, he shall not be protected by privilege. To my mind it is clear that the Committee on Privilege, from Article 115 and 116, is empowered to handle matters of misconduct concerning Members of Parliament, and Members of Parliament only. The issue of Contempt of Parliament comes under Articles 122 and 123 of the 1992 Constitution. Article 122 states, ?An act or omission which obstructs or impedes Parliament in the performance of its functions or which obstructs or impedes a member or officer of Parliament in the discharge of his duties, or affronts the dignity of Parliament or which tends either directly or indirectly to produce that results, is contempt of Parliament. Article 123 further states, ?Where an act or omission which constitutes contempt of Parliament is an offence under the criminal law, the exercise by Parliament of the power to punish for contempt shall not be a bar to the institution of proceeding under the criminal law.? Mr. Chairman, Articles 122 and 123 do not particularize what exactly is meant by ?obstructs?, ?impedes? or ?affronts the dignity? of parliament, but of more import is the fact that the two relevant provisions quoted above do not provide for the processes by which somebody deemed to have acted in a manner contemptible of parliament, should be processed through. This power is nowhere explicitly provided in the Constitution, and explicitly have not been added onto the powers of the Privileges Committee. At this point, I wish to point out that I was invited to appear before the Privileges Committee of Parliament in my capacity as a journalist and newspaper editor, and I am concerned about that, because while I believe greatly in responsible media practice, I believe even more in the protection of the media from intimidation or any signs of same. Unfortunately, I must apologetically state that the invitation to journalists in future could be seen as amounting to intimidation. Like Parliament and its committees, the journalism profession also derives its powers from and under the 1992 Constitution. The same Constitution explicitly provides for the protection of journalists, and modes of relief for persons aggrieved by the conduct of journalists. These are broadly captured under Chapter 12 of the 1992 Constitution and I believe that when Members of Parliament or Parliament believes that journalists are in contempt or have acted in a manner that is unacceptable, the provisions under Chapter 12 can be applied. In the light of the foregoing, I would respectfully plead with Mr. Chairman and his Committee to advert their collective mind to the above provisions in future, when such unfortunate incidents happen that in the opinion of certain members, affront the dignity of parliament. Before I conclude I write this letter only as my contribution and as part of my thoughts on how to build a safe democracy that guides, guards and protects all of us. I respectfully thank you for your indulgence. Previous articleDid Mayweather Actually Buy a $4m Koenigsegg Car?